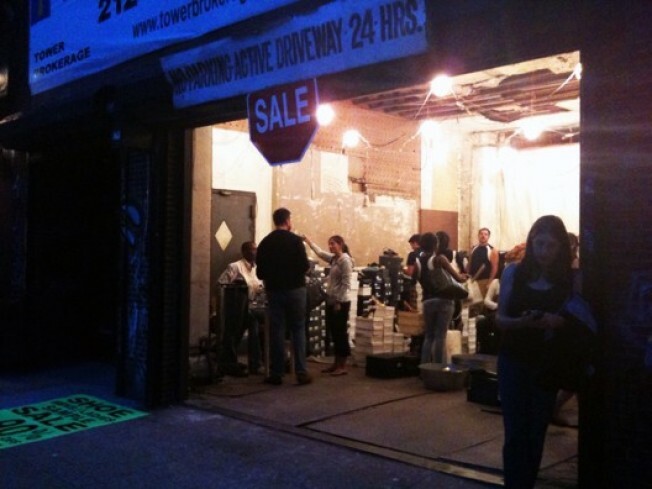 When we stopped by Steven Dann's shoe and bag sale in Soho last night, the place was hopping. Dann, who has a store on the Upper East Side and one in Great Neck, picked a completely raw space at 220 Lafayette Street to unload his selection of Givenchy heels and Valentino bags. There's no real ceiling to speak of, just slats of wood, and the only signage is a neon green sidewalk poster shouting "EVERYTHING MUST GO!!" outside the entrance. Once you're in, all focus is on the shoes. Dann imported most of the merchandise from his Great Neck store, figuring that shoes left languishing on the shelf in the suburbs might find some love in the city. The sale hit a snag yesterday when the shipment was late, but the delay didn't seem to have put much of a dent into business. By the time we arrived around 6:30, he'd sold out of nearly all the Givenchy, all wallets, and a ton of snow boots, and gone through his entire supply of python makeup cases. We still found plenty to ogle, though. A pair of vampy feather-trimmed Givenchy heels were $247.50, marked down from $495 (everything was half-off the listed price.) Cassedei wedges were $442.50, and Valentino heels were $297.50. At around $600, only a few Valentino bags were left, but they were all from the fall '09 collection. And if you happen to be looking for Tory Burch, then you should probably head over there as soon as the sale opens again at 11am. Dann has wedges, clogs, boots, flats—pretty much everything except black bags, which sold out yesterday afternoon. ("We're getting a lot of college kids in here, I think," said a salesman.) The men's selection was about half the size of the women's, but it looked promising as well; Converse by John Varvatos strikes us as overpriced at $95, but $47.50 seems like a reasonable amount to pay for a pair of revamped old-school lowtops.